Staying in the campgrounds is a unique experience all on its own that enhances the overall festival. There's a convenience factor to being able to walk back and forth from your campsite to the festival and not having to deal with traffic, expensive rideshare/cab rides, and long walks to the pickup/drop-off areas. More importantly, it's just a lot of fun hanging out at your campsite making friends with your neighbors, playing drinking games, and playing music until you're ready to catch your first set of the day. Coachella always has great food, including samplings from some of the best restaurants and food trucks in LA. You'll pay a Coachella premium for some items, but it's nice having a variety of menus to choose from so you don't have to eat the same type of food all weekend. My go-to foods at Coachella are avocado toast for breakfast in the campgrounds and Spicy Pie inside the festival. Spicy Pie isn't exclusive to Coachella, but it's fast, filling and delicious - perfect if you're hungry but also late to a set you want to catch. Every year, Coachella features new art installations that always surprise you when you walk into the festival grounds on the first day. Sure, they're great for selfies and group photos, but they're also perfect landmarks to meet under when you and your friends eventually get separated. My personal favorite was the 36-foot tall spaceman from 2014. Its size alone was amazing. It also moved throughout the festival, so sometimes you'd see it by the main Coachella stage and later you'd see it at the other end by the Sahara tent. Last but not least is the huge lineup of artists representing a variety of genres. You can soak up about 12 hours of music per day across 8 different stages. Each stage has something different to offer, whether you want to see the big headliner at the main Coachella stage, catch an up and coming artist at the Mojave tent, be surrounded by lights, lasers, and LED screens in the Sahara tent, dance to some techno with air conditioning in the Yuma tent, or party at the colorful Do Lab stage with secret performances each day. 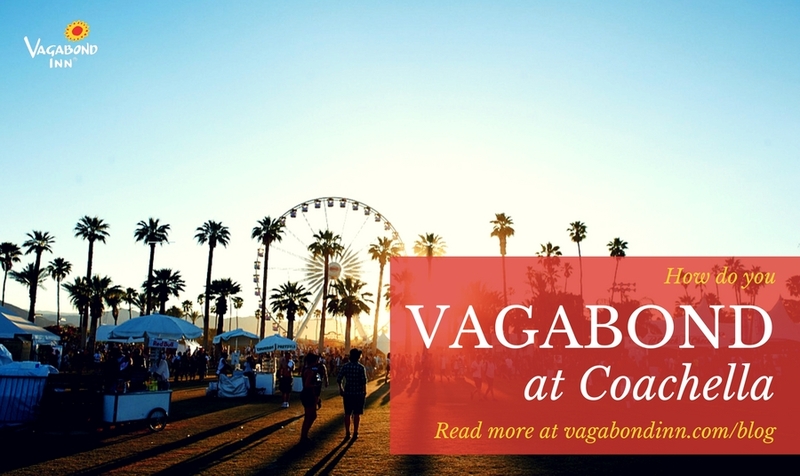 Make the most of Coachella by staying at the Vagabond Inn Palm Springs, located only 20 miles from the festival grounds. We offer free parking and shuttle service to the event so you can get to the event on time and catch the Coachella line up. Take advantage of our Coachella INNsider Rate for 15% off your stay. Your reservation includes free parking, free Wi-Fi, and a complimentary continental breakfast. Choose from Deluxe King or Deluxe Queen non-smoking rooms furnished with a microwave and refrigerator for a comfortable stay over festival weekend. Book now!